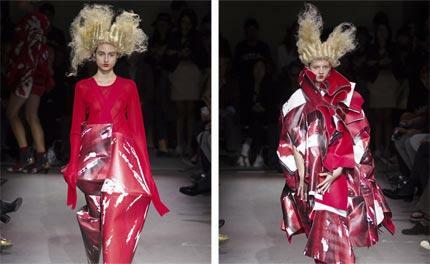 What horror movies might Rei Kawakubo have taken in recently? With the fiercely private Kawakubo, we'll never know for sure. But her runway for Comme des Garçons, dripping in a Lucifer-shade of luscious red, seemed newly menacing and rooted in nefarious ground. The designer worked nearly exclusively in devil's red, cutting fiery velvets, patent leathers or regular leathers into evil sorcerer-like capes and hooded cloaks, not to mention dresses covered in scales and layers of curly ruffles. Even when indulging in her trademark bulbous appendages or a dress that looked like a bowl full of roses, her clothes still managed to possess a satanic flair. At one point, the volume boosted dresses came cut from a pattern that looked like blood-splattered cotton or leather. Something wicked comes this way next spring… and we'll take it willingly.